Imagine each was imprinted on a clear card the size of a playing card. Can you match each symbol with its meaning? Of course you can… Symbols predate culture, language and even the concept of time. They are so much a part of us that we respond to them intuitively and often on an other-than-conscious level. Symbols comprise the primary language of the psyche. They are “pictures” of forces and dynamics in everyday life to which we can all relate. Imagine that each color below is on a card the same size as the symbol cards. Placed behind the symbol card, the color shows through. Chose a color for each of your two symbol cards that “feels right” or “goes with” that symbol. Can you intuitively link the color with its attribute? Now, try to mesh the meanings of the symbols and colors you chose. What can this say about one’s current functioning and experience? How can this help articulate an issue and one’s feelings about it? Imagine that there were 39 symbols, three symbols at each of 13 developmental stages. Imagine that each of the thirteen stages represented a different and universal stage of development. Imagine that there were 45 colors of different hues and intensities -each with its own possible “meaning”. Color is the language of emotion as well as of the physical body as experienced. How would a symbol with color illuminate its “stage”? How does one stage relate to the next? 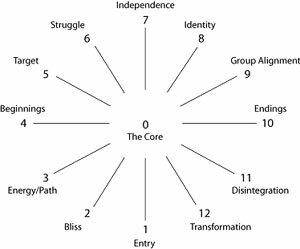 How does each stage relate to “the Core”? How does one stage relate to the one across the axis from it? What could happen if one “gets stuck” or “has issues” at any given stage? What do you think a chosen symbol and color can reveal about one’s sense or experience of that stage? How might the choices of symbols inter-relate? The opportunities for depth and discovery are endless! It is here that the full synergistic dynamism of the psyche reveals itself through the relationship of stage, symbol and color*. This little sample test is an attempt to give you some idea of what you would learn in the MARI® training. Hopefully, it also gives you some sense of the magnitude of revelation inherent in the MARI®. *Remember, the symbols depicted here are not the actual symbols of the MARI®, and you are seeing but a fraction of the number of symbols and colors. Imagine the possibilities! You can soon download a Mini-MARI app called “Insight Self-Insight” for your iPhone and iPad. Contact MARI Creative Resources to see when it will be available.